Design Therapy: Is This A Dream? Somebody pinch me! This room designed by architects Shelton Mindel is nothing short of spectacular. For me, this firm creates the most stunning interiors and when people ask me who I would have design my own home...these guys are at the top of my VERY short list. Established in 1978, this New York City based office provides architectual, interiors and product design services for corporate, cultural, academic, retail, recreational, hospitality, and residential clients. Hear me now, believe me later-you will see a lot of more of their work featured here on Design Therapy. 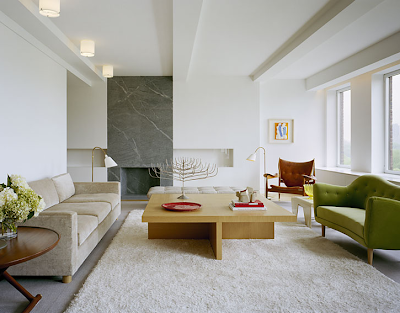 (http://pleasesirblog.blogspot.com/2008/09/inspiring-interiors.html). Can you tell me who makes these? I would love to browse more. Thank you so much! Your work is beautiful and serene.